Climate change has been a hot political topic of debate. Many people think that it is the most important issue of our time. We have to reduce our fossil fuel consumption now, otherwise we will soon face very negative, maybe even catastrophic, consequences from a warming planet. This, in a nutshell, is the official narrative we hear everywhere. Only nutters would think that there is anything wrong with it. I am one of those nutters. I don’t think this narrative has as much substance as most people think it has. In fact, I will argue, most of the climate change narrative just does not make much sense. I have been a critic of this movement for a long time. From the moment I started to look deeper into the issue, I immediately could see problems with the science. This was about 20 years ago. Now, two decades later, my skepticism has only deepened. There are too many things that just do not add up. In the following, I will argue in detail, what I think is wrong with the official narrative. I am going to start by laying out my concerns with the science. I will then continue to argue that no matter what the climate is going to do, the future will be bright. In other words, I am going to make a case for hope. And I am going to do this from a layman’s perspective. I am not a climate scientist. I am not even a professional scientist of any kind. I edit and mix film sound for a living. And yet, I don’t think that one has to be an expert in order to be a critic. There are simple, easy to understand, arguments why there is no reason to panic. If you don’t believe me, then please just continue reading, and judge the arguments for yourself. All I am asking is to be open minded. That is not to say that I have not done any research on the subject. To the contrary, I have extensively listened to both sides of the debate. Of course, it is possible that I am wrong. It is possible that I am simply missing something. But so far, I have not heard any refutations of my arguments for hope. If you can find any flaws in my reasoning, I would love to hear from you! It is important to understand that these are three separate thesis, each of which could be true or false independent of each other. Even if there is a human made global warming, this does not necessarily have to be a problem. On the other hand, if there is no global warming than that could be a problem. And whatever the problem is, it is not a given that the only way to deal with it is to prevent it from happening. In the following three parts, I am going to take on each of these thesis one by one. I am going to show for each of them, why I think that the official narrative is, at the very least, one sided, if not outright wrong. Is human made global warming real? Let me start with the science. Are humans warming the planet? Science should ideally be neutral. It is seeking the most accurate description of reality. It is, therefore, about rationally examining the arguments to come to the most reasonable conclusions. This, however, is not quite the state of the public debate about climate science. As soon as the temperature of the atmosphere is debated, I have found time and time again that people can get very emotional. Why is that? One might argue it is because so much is at stake. We don’t have time to let critics distract us from solving one of the biggest problems of our time. But is this really how we usually react to discussing problems? Say someone goes to a doctor, and gets diagnosed with a very aggressive form of cancer. Life expectancy, according to that doctor is max. another 6 month. How would the average person react to that? Personally, I would believe the doctor that the problem is real. It seems like a good starting point. After all, he is an expert and knows much more about the subject than I do. It therefore seems reasonable to take him seriously. But what if a critic came along and told me that he had good reason to believe that my doctor was wrong. The diagnosis was flawed, and my chances of survival actually quite good. How would I treat this critic? Of course the guy might be a nutter who does not know what he is talking about. But given that I am facing a huge problem, would I not be very interested to at least hear what he has to say? More than once have I seen people with deadly diseases desperately listening to any alternative theory, in the hope to find some crack in the official diagnoses, or maybe at least find an alternative treatment. A dogmatic believe in an authority seems like the least rational approach, when we face a huge problem. This, however, is not the reaction I get from most people who see climate change as a big problem. Far from it. The most common reaction to skeptics is not interest, or even joy, but outright anger. For some reason, the very idea that climate change might not be a problem, terrifies a lot of them. In fact, I am willing to bet that if you, dear reader, are a believer in the theory of catastrophic climate change, and you have made it till this point, I got your blood pressure up, just by stating that I am going to make arguments against the official narrative. I got your blood pressure up, even though I have not yet made any real arguments at all. Chances are even higher though that I have already lost most believers at this point. Even though climate change is a scientific subject, we don’t have a very rational debate about it. Critics are often immediately attacked ad hominem, as deniers who must have evil motives. Calling someone a denier implies that he knows better. He knows that what he says is not true, but, to advance some evil agenda, decides to publicly go against the truth. It also creates associations with holocaust deniers. They too go against, what they must know, is the truth, in order to justify evil politics. The bad agenda when it comes to climate change skeptics is clear: critics are working for the evil fossil fuel industry. Sources for that claim, however, are rarely checked. I have yet to find any convincing evidence that there is a systematic financing of critics by the big oil companies. This seems to be more of an internet roomer than a fact. But as so many things in this debate, facts are never really checked. They are willfully copied from one internet blog to another, because, weirdly, a lot of people seem to outright like the climate disaster narrative. Another thing that is weird about it is that it is assumed that no one could possible be right who got funded by the oil industry. On the other hand, this whole argument also assumes that government funding is completely neutral. Both seem like very questionable assumptions to me. CO2 is a greenhouse gas. Enriching the atmosphere with it will lead to warming due to the greenhouse effect. The burning of fossil fuels frees up CO2 which has not been in the atmosphere for a very long time. This extra CO2 will therefore lead to a warming of the planet. Since life on this planet is tuned to the current climate, any deviation from it will have catastrophic consequences for humans in the not too distant future. How do we know that all of this is true? Answer: there is a consensus among the scientists. Most people exclusively rely on authorities for their confidence of knowing the truth. The scientists agree, therefore, who am I, or anyone else, to question this theory? The idea here is clearly that truth is a matter of majority believe. But scientific truth is completely independent of majorities. A theory either accurately describes reality or not. Would the earth be any more flat if more people believed it was? The history of knowledge is full of examples where the consensus got it wrong. From a believe in a flat earth, to eugenics, racism, and the believe in all kinds of gods, the majority of experts got it wrong many many times throughout history. And it was usually lone outsiders who changed that consensus. The most impressive example of a mistaken scientific consensus is probably the falsification of Newton’s physics by Einstein. Newton’s physics was not just accepted among scientists. Until Einstein came along, there were literally zero critics of it, meaning the consensus was 100%. People were fascinated how complete and beautiful his theories were. And then Einstein came along. Einstein was not a professor at a major university. He worked at a patent office in Bern when he developed his blow to Newton’s physics. But he showed, very successfully, that Newton’s theory was wrong on a very fundamental level. He faced significant opposition from the scientific community. Today, however, the consensus has changed towards Einstein’s theory. Time will tell, whether this consensus is any more true. Science is not about a consensus. It is about good arguments. It is about checking theories against observations. And, in a strict sense, science cannot ever really be settled. As the philosopher Karl Popper pointed out, there is always a possibility that any scientific theory, no matter how well documented, is wrong. Relying on a consensus can certainly be a rational strategy to form a first opinion. But it cannot be an argument in a scientific debate. And yet, when it comes to climate change, not only is this an argument often used against critics, it has turned into the most important argument for the case of catastrophic global warming. It is the argument used to essentially shut down any critics, before the criticism can even be voiced. That is not science, that is cult like dogmatism. The irony is that the consensus is not even as clear as most people assume it is. The number often quoted is a 97% consensus among scientists about a catastrophic man made global warming. The first thing to note is that even that number suggests that 3 in 100 scientists disagree. That is not nothing. It is far more than one would expect from other “settled” scientific theories. If we asked scientists whether the earth is flat, or whether it is possible to travel faster than the speed of light, we would get a far better consensus than 97%. But even the 97% consensus number in the climate debate is questionable. These studies are quite dubious. Some, for example, do not ask scientists directly about their opinion, they simply infer what the authors of published papers probably believe. The 2013 John Cook survey, which came up with a 97% consensus, did not even ask a representative sample of scientists. It only examined papers of scientists “taking a position”. Meaning, the group of scientists, whose opinions made it into the survey, was pre selected by a bias. And those biased scientists then, surprise surprise, agreed. Other studies simply did not ask about a consensus of the catastrophic global warming narrative, but instead examined the opinions on much more trivial parts of the theory, on which there is indeed a huge agreement. I will get into that in a moment. The best way to challenge the consensus narrative, however, is to simply look at who the critics are. And there are many. In 1998, and then again in 2007, a petition, now known as the Oregon petition was signed by over 31000 scientists (not just climate scientists to be fair), urging the US government to not take action against global warming. These scientists clearly do not agree that we are facing a catastrophic man made problem. And 31000 is not a small number. Among the critics are very renown scientists, like Richard Lindzen – atmospheric physicist at MIT, William Happer – physicist at Princeton or Freeman Dyson – theoretical physicist and mathematician at Princeton. These are Ivy league professors who are openly declaring their disagreement with the official narrative. So if one cares about being in good company, there is certainly no shortage of that on the critic’s side. But then again, it should not be about whose company one is in, but about the arguments itself. When it comes to the actual science, there is indeed an almost consensus about certain aspects of the official theory. So far, I have not heard good arguments against the following three assumptions. I will therefore assume that they are true. 1) The greenhouse effect is real. Certain gases in the atmosphere will keep energy from escaping the planet. On its own, more energy is equivalent to higher temperatures. The greenhouse effect has been known for almost 200 years. It is basic physics and can be measured in a laboratory. 2) CO2 is such a greenhouse gas. Burning fossil fuels will add extra CO2 to the atmosphere. Therefore, by consuming fossil fuels, we are enriching the atmosphere with a greenhouse gas. The amount of CO2 in the atmosphere has increased from 280ppm before the industrial revolution to 400ppm today. 3) In the last 150 years, the temperature of the earth has warmed by about 1°C. The last one is actually the least certain of the three. It is not so easy to measure the temperature of the earth. Especially not to the precision of tenth of degrees. When scientists, at the end of the 19th century, started to keep temperature records, they did not have the means, nor did they care too much, about tenth of degrees temperature differences. They where interested in the weather. And when it comes to the weather it is not important whether it is 20.4C or 20.6C warm. It also matters where the thermometer is places. Nearer, or further away, from a building, or the ground, might give us different temperatures. It is not clear where exactly to put the thermometer to measure the temperature of the earth. It is also questionable what value such an average has. A changing climate will look very differently in different places of the planet. Leaving all these concerns aside, we always need to form our opinions on the basis of the best data available. And the best data seems to suggest that the earth has warmed by 1°C since the end of what is know as the little ice age. These three assumptions are indeed assumed to be true by the vast majority of scientists. I have no reason to doubt them. That means, asking scientists about them will result in an impressive consensus. But there is a problem: from this does not follow that any of the original three IPCC thesis are true. How can that be? This must be a mistake. If the greenhouse effect is real, and we are enriching the atmosphere with a greenhouse gas, then surely, the atmosphere has to warm up. Everything else seems illogical. Whenever people publicly argue about the science beyond mentioning the consensus, it is usually this simple reasoning that is presented. But it is here, where my skepticism started 20 years ago. There is a fundamental error in it. The argument assumes that the relationship between CO2 and the temperature of the atmosphere is linear. That means, for every CO2 increase there is a certain amount of warming as an output. But the Atmosphere is definitely not a linear system. It is one of the most complex systems we know, complex to the point of being chaotic. In fact chaos theory has its origins in the prediction of the weather. What is the difference between a complex and a linear system? In a complex system the relationship between a variable and the output can be highly complicated. It can be so complicated that it becomes impossible to predict. That is to say, impossible to predict within a certain rage. To be sure, the outcome of every system can be predicted with a limited precision. For example, if I drop a glass onto the floor so that it breaks, I can predict the whereabouts and size of the pieces within a clearly defined range. With pretty much 100% certainty, the pieces will be somewhere on the floor of the room, and every single piece will be smaller than the glass itself. The smaller I make the range of my predictions, the more likely I will be wrong, until the point where my predictions are not better than chance. Even though this looks like a fairly simple system, it will be practically impossible to predict the exact size and location of all the individual glass pieces. That is because, for this type of precision, the system is simply too complex. Every little variation, from tiny imperfection of the structure of the glass, to air movements and the structure of the floor, everything will influence the outcome significantly. And we cannot know the parameters of the system to the precision we need. It is important to understand that the reason we cannot predict this system precisely is not because we do not understand the physics involved. We have a pretty good understanding of the physics. And yet, despite that, it is in practice not possible to predict this seemingly simple system. That means that we cannot really hope to make significantly better predictions in the future. The nature of the system is fundamentally unpredictable if we wanted to predict it very precisely. With almost 100% certainly, I can predict that air temperatures in London in July will be somewhere between 0-40°C. That is where they historically have been. This does not look like a precise prediction. It is definitely not precise enough to plan outdoor activities ahead on every given July day. However, if we consider that the theoretically possible temperature range goes from -273.15°C to tens of millions °C the system actually looks remarkably stable. The more precisely I want to predict the weather on any given day, the more likely my prediction will fail. And we all know this, since weather predictions are often no where near as accurate as we like them to be. The atmosphere is a complex system, with many factors influencing the outcome. From the sun to clouds, oceans, winds etc, how all these factors influence each other needs to be understood precisely, in order to make exact predictions. But even if we did understand all these complex interactions in the atmosphere very well, that is not to say that we would be able to predict the earth’s temperature precisely. There is a distinct possibility that we will never be able to predict the climate within the temperature range that we would like to. One cannot simply look at one factor and determine that this factor will influence the outcome linearly. There might very well be other factors in the system that either weaken or amplify the outcome. And yes, weakening is a real possibility. Take our body’s temperature. Our bodies are certainly also very complex systems. 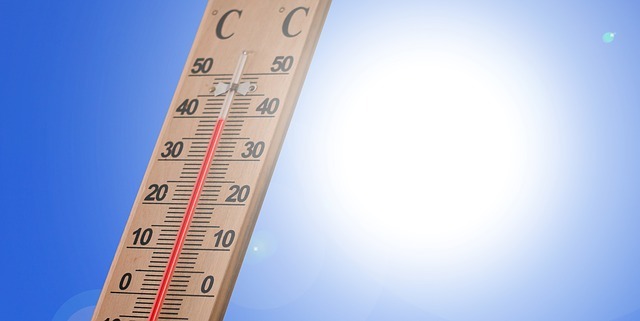 If we heat up the environment, and therefore add energy to our body, can we assume that our body temperature will rise linearly with the temperature of the environment? Of cause not. If it gets hotter, we start to sweat. Conversely, if it gets cooler, our bodies start to actively produce more heat. These are build in mechanism to regulate the temperature. It prevents a linear relationship between outside and body temperature. These mechanisms keep our bodies at a stable temperature. That is the reason why our body’s temperature is fairly predicable. But even it various within a very small range. Very precise predictions of tenth of °C would be very difficult. This is the key to my skepticism about the official climate change science. We are trying to predict a highly complex system within a temperature range in which it has historically not been stable. That, in principle, should be extremely difficult, if not impossible, to do. And yet, I see politicians, people who have trouble organizing a good mail delivery service, meeting at fancy conferences to discuss, which temperature the planet should have. They are seriously debating, how to limit the increase of temperatures to 2°C. One does not need to understand much about climate science to understand that this is outright ridiculous. The temperature range of the earth in the last 20 000 years alone, has varied by at least 7°C. Humans had nothing to do with that, and survived the changes without major problems. In fact, we only really started to flourish in the warmest periods. We will get back to that a little later. In order for us to have any chance of making predictions based on the greenhouse effect alone, one needs to assume that the greenhouse effect of CO2 is somehow such a strong factor that it will dominate the temperature in the future. Even more than that, one would need to argue that CO2 will somehow trigger some other warming mechanism within the atmosphere that will amplify the warming. That is because the greenhouse effect of CO2, which, as mentioned, we do understand, does not give us much warming on its own. The increase of temperatures from this effect is roughly logarithmic. That is to say, for every doubling of CO2, we get the same amount of warming, which is about 1°C. Let us do the calculation. We start with 280ppm before the industrial revolution and are currently at 400ppm. In order to double the amount of CO2 in the atmosphere, we would need to get to 560ppm. Absence of any positive or negative feedback, that would give us about 1°C of warming. To get another 1°C, we would need to double that again to 1120ppm. And for another 1°C, we would need to get to 2240ppm. What that means is that, just with the greenhouse effect on its own, to get to only 3°C increase in temperature, we would need to octuple the amount of CO2 in the atmosphere. We haven’t even doubled it since the industrial revolution. Yes, the greenhouse effect of CO2 is real, but on its own, it is actually not that scary. Since it is logarithmic, most of the warming happens at the beginning. That means we have already seen the majority of the warming from it. To get more warming we need to assume some kind of positive feedback mechanism of the CO2 greenhouse effect in the atmosphere. In other words, a feedback that would amplify the warming significantly. Does such a feedback mechanism exist? It is certainly possible. This is where the complexity of the atmosphere comes in. In order for us to understand such a feedback, we would really need to understand the climate very precisely. And we simply don’t. Even the IPCC report itself lists lots of unknowns within the climate models. And of course we cannot be certain that there are no unknown unknowns. This is exactly where there is a very active debate among scientists, and no consensus at all. We do not understand how sensitive the climate is to CO2. And without such an understanding, precise predictions of the earth’s temperature are simply not possible. As I said at the beginning, I am not a climate scientist. I do not understand the details of climate models, but I do understand the problem of trying to predict complex systems. And there is something else I understand: Any good scientific theory needs to be able to predict the future. In other words, any scientific theory needs to be testable. If a theory fails to make accurate predictions, there must be something wrong with it. If a scientist predicts that B follows A, and then we observe that C follows A, we can be certain that there is something wrong with that theory. That is true, even if we know nothing else about that theory, at least if we assume that the scientist used his theory correctly. If I am right with my skepticism, I would expect predictions of climate models to be overall fairly bad. After about three decades of global warming theory, enough time has past to take a look at some predictions climate models have made. How do they hold up against actual measured temperatures so far? 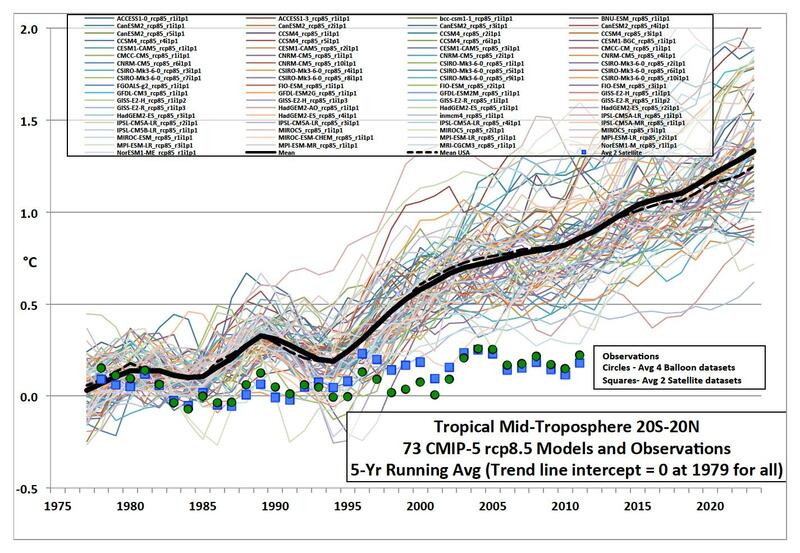 This is a chart from John Christy, a climate scientist of the University of Alabama. 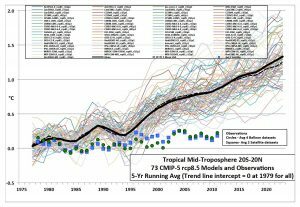 It shows a mean of all the prediction of all the existing climate models, as compared to the actually measured temperatures. As we see, just as I predicted, the predictions do not match the real temperatures we have measured. And it is interesting to see that all of them overestimate the warming. The actually measured temperatures have gone sideways since the late 1990th. This is the reason why we now talk about climate change rather than global warming. The warming just did not happen, and so talking about global warming became increasingly embarrassing. Climate change, on the other hand, cannot be falsified, since the climate is always changing. It is also interesting to see that the models divert from each other at all. After all, we are constantly being told that the science is settled. The science is settled to the degree that we can make precise policy decisions. Why is it then that these models disagree even with each other, let alone with the actual measure temperatures? Clearly there must be lots of things in the climate that we do not understand. Or, worse, if that is the track record of models that do understand the climate, then predicting it seems hopeless. I want to be clear here. There are a lot of critics who suggest that the lack of an increase in temperatures proofs that the atmosphere is not warming. That is not my own view. I think the inaccuracy of the models shows that we do not understand the climate. But it is perfectly possible that we will get a warmer climate in the future, caused by CO2. Complex systems can behave in very extreme ways. Nothing happens for a while and then suddenly we see huge moves. A snow avalanche is a good example of that. Everything looks calm while the snow builds up, and then suddenly all hell breaks lose. Predicting the exact moment the avalanche will go off, however, is impossible. I am not saying that we will get a lot of warming either, I am just saying it is possible. My real point is that we do not know what the future holds. The climate is difficult, if not impossible, to predict. Some theories even suggest that we will soon see a new ice age, since we appear to be in a interglacial warm period. So there we have another reasonable possibility. Reasonable predictions, therefore, range from predicting a significantly cooler to a significantly warmer planet. That is not very useful. Only time will tell, who has got it right. As the record of climate predictions shows so far, we definitely do not understand the climate, and it is questionable, though not impossible, that we ever will. Unpredictability, however, is very difficult for humans to accept. We are so desperate to know what is gong to happen that there has always been a market for bogus future predictions. Even today, psychics, horoscopes and tarot cards remain popular for precisely that reason. But these are just the most obvious charlatans selling nonsense future predictions. It is a big industry! At this point many will point out that, yes maybe global warming is not as certain as portrait in the media. But, given that we know it is going to be a disaster if it happens, should we really risk it? Is it not wise to maybe panic a bit too much instead of being hit by an unexpected avalanche in the future? Playing it save is an argument that instinctively appeals to many people. But the question is how save is that play? To answer this question, we will have to examine the other two IPCC thesis, which is what I am going to do in part 2 and 3.